Çayönü Tepesi is a Neolithic settlement in southern Turkey that was inhabited for thousands of years. I'll give it a lot of space here because: i) it is supposed to have contained the oldest native copper objects ever found, and ii) I had - somewhat unexpectedly - a hell of a time to get reliable data and pictures! The settlement covers the periods of the Pre-Pottery Neolithic A (PPNA), the Pre-Pottery Neolithic B (PPNB), and the Pottery Neolithic (PN) and thus gives all those archeologists pottering around an opportunity to use all those cool abbreviations. It is claimed by some that Cayönü Tepesi provided the archaeological world with several 'first's': animal husbandry, terrazzo floors (stone pieces pressed into a cement base and then polished), woven cloth and several female figurines. Most important for us: copper has been found in Cayönü Tepesi! But before I delve into the (relatively boring) ancient metallurgy at Cayönü Tepesi, I will give you a glimpse of the more interesting things found there. First we need to look at the "stratigraphy", at what was found in different depths or layers. Typically we have: the deeper, the older. Slightly simplified and with extrapolations / interpolation from the various articles I consulted and that never quite agree on these points. Round huts: Wattle-and daub huts, built on virgin soil with plastered, slightly sunk floors. No temples or communal structures. Aceramic or without pottery vessels but with (sun-baked?) clay figurines of animals and a few of humanoid form. Interestingly, no pictures of these figures are in the Net. The bulk of the artifacts consists of chipped stone tools of flint and obsidian; implements of horn and bone are also fairly common. Grill-planned buildings: North-south oriented rectangular houses with three sub-sections. The largest room at the north end looks like a grill from above and served some unknown function (e.g. foundations for a raised living room; climate or humidity control?). The grille phase is immediately superimposed over the round hut sub-phase, without an interruption. There is also one big special building with a flagstone floor from limestones; see below. Channeled Buildings have a kind of paved floor, occasionally interrupted by parallel "drainage" channels. This evolved from the "grill concept" where the grill-like foundation walls have actually become a part of the floor and the previous ventilation openings have become the channels. There is also a special building called "skull building" (see below). Cobble-paved buildings The fourth occupation level had stone foundations and formed cell-like units with walls built of mud brick. Cell-planned buildings buildings of the cell sub-phase are considerably more massive than the buildings of the other sub-phases, they have been well preserved almost all over the site. They also had two stories, the second floor was made from mud bricks and had a flat walled-in roof. Then there is the huge (12 × 9) meter Terrazzo building with an extremely elaborate terrazzo floor, i.e. white or red chalk stones, embedded in some chalk mortar and and then polished in such a way that white - red stripe pattern resulted. It contained a kind of altar (like the skull building) with a stylized human face in raised relief. No picture of that in the Net either. The building types. Colors indicate special floors. Source: Adopted from: A. Özdogan, Mehmet Özdogan: Çayönü. A Conspectus of Recent Work. In: Paléorient. 1989, Vol. 15 N°1. pp. 65-74. The few hundred people living in Cayönü are believed to be the first farmers of Anatolia (or the world). It appears that like the Hallan Çemi people they also preferred originally to domesticate pigs and not sheep or goats. Judaism or Islam wasn't invented yet and eating pigs was still OK in Turkey and even in Jericho. However, the Cayönüsians still appear to be the first folks who also domesticated sheep and goats a little later for the first time in human history. They also planted and experimented with some cereals. Çayönü was also the site of the earliest known piece of cloth, possibly a a linen fabric, woven from locally grown flax. A figurine of a female deity was also found on the site, implying that some kind of religion, not yet forbidding all the pleasures of the flesh like eating pigs, was an important aspect of everyday life. This deity may or may not be represented by the figure shown below; sources are a bit vague here. Double Goddesses, as they are sometimes called, are not rare and found all over the world. The represent the basic yin-yang of everything, bipolarity like day and night, death and life, or the female biological cycle of ovulation and menstruation and thus somehow female autonomy if not superiority. Or something else. The skull building got its name because about 70 skulls were unearthed in the small antechambers. Later also (skull-less) skeletons were found. Since the main room contained a kind of cut and polished stone block or altar (weighing about 1 ton!) and a large flint knife, we are inclined to assume that the building served some sinister cult, rather unpleasant to some people who might have lost their head in there and did not have a spare one, like their supposed goddess. Indeed, microscopic analysis of the altar stone's smooth surface revealed residue of animal and human blood, about 9 000 years old, according to "accelerator mass spectroscopy" radiocarbon dating. If one takes into account that the Cayönü Tepesi people never got around to cultivating barley and thus had no beer, it is conceivable that they might have been given to occasional violence. Who wouldn't under those conditions? Source: Hadi Özbal: "Ancient Anatolian Metallurgy". Internet presentation. With friendly permission. Now to the climax: Cayönü Tepesi, it is generally claimed, is the place where metallurgy started! Or maybe not. Looking through the available literature confused me in a major way. So what are the facts? As far as I can tell, around 113 copper beads, hooks, awls, and pins and were found2). They are from the grill-plan phase and date to 8 200 BC - 7 500 BC. Source: Obscure power point teaching material without clear reference. Probably going back to a 1990 Özdogan paper. The objects were made from native copper that came "from an ore deposit at Ergani Maden, only 20 km away, which is still worked for copper today" says Richard Cowen from the University of California, Davis, in his "mygelogy" site. There seems to be some consensus that the Çayönü smiths did not just employ cold-hammering but also used some heating ("pyrotechnology") in between hammerings. Only rarely, however, and without understanding the finer points of annealing and work-hardening. 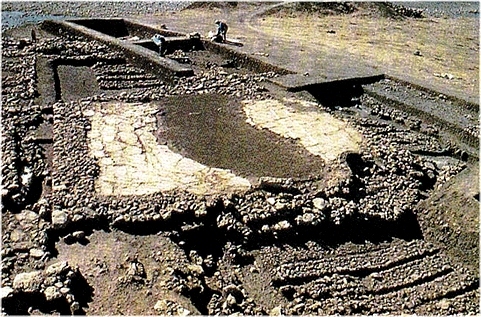 Ünsal Yalçin and Ernst Pernicka (eminent archeometallurgists), in a 1999 paper1), give a detailed analysis of copper beads unearthed at the Asikli Höyük site dating (in their view) to 8 500 BC or earlier instead of 7 800 BC - 7 600 BC as assumed before. That is about the same time horizon as the Cayönü Tepesi copper artifacts, challenging who was "first". Very pure native copper and simple "pyrotechnology" was also used in Asikli Höyük. 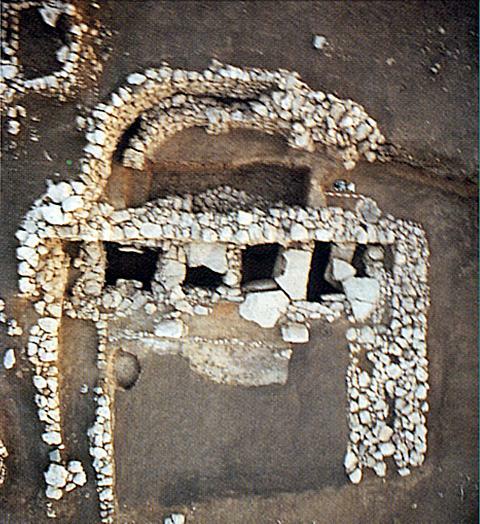 On the other hand, no copper artifacts were found in the contemporary and near-by settlement of Cafer Hüyük, recounts Tamara Stech, another well-known archeologist working in this field 3). 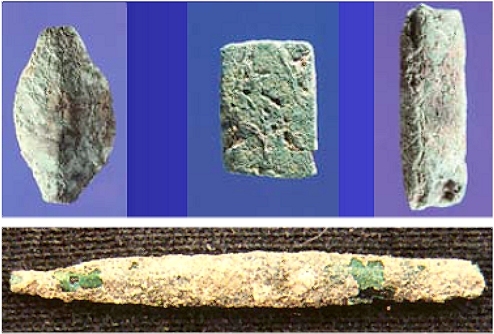 Besides the Cu artifacts, hundreds of malachite disc beads and much debris from the processing of malachite was found in Cayönü Tepesi; and all of this was concentrated in two places, the court yards of buildings from the grill-plane phase around 8 000 BC. What's the verdict? Before I commit myself, I need to make one thing clear: Whatever point of view I or anybody else holds now will not survive in all details. More and more data from analyzing and re-considering old findings are coming in right now, and that will continue for some time to come. Completely new insights from discoveries yet-to-be-made will bring surprises. That does not only apply to the history of metals but to anything from pre-historic times. Always bear in mind that whatever was found in those old places is just an incredibly tiny part of what was actually around. Some 100 tiny copper pieces is all we have to deduce what was going on for hundreds or even thousands of years. Good Luck! Be extremely critical with respect to all interpretations! We simply don't know how more or less organized societies really ticked some 10 000 years ago. They might have had some sinister bloody cults, killing virgins or whoever in the "skull building", or it might have been just their quaint way to bury their dead in two parts. Why they spend considerable time and labor for making the "grill" structure nobody really knows. Same thing for the cell structures. If they simply didn't like gold or just never came across it is unclear, and so on. With respect to copper there might have been some small "industry", jealously guarding the "secret of copper", and we only have very few finds because the stuff was treasured and recycled. Contrariwise, it just as well might have happened that the considerable amount of malachite, imported from some distant source, occasionally was "contaminated" with some native copper (quite possible), and the people working the malachite just played with it a bit, without paying much attention.